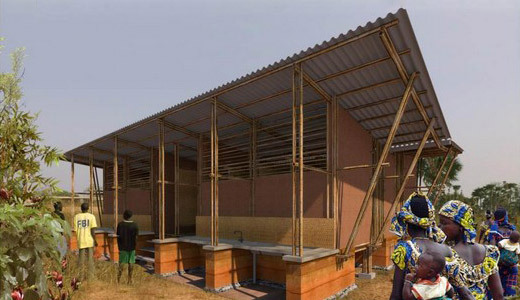 from February 2018 to July 2020, Nka Foundation is collaborating with some of the design teams of the Top 40 Designs in the competition to organize construction workshops to build their designs based on site at Diakunda in Bounkiling at the Casamance area of Senegal. Each workshop will run for 12 weeks or more according to the design. To do this, we have begun to compile strategies and gather a community of supporters around the rural vocational arts school project. We approach the school design and construction project as a development-aid with a direct impact on the rural communities in Bounkiling in the Sediou Region of the Casamance. It is a community development project. By this, the design proposals will be built on a land donated to Nka Foundation by the community. Through an open call for participation, each workshop will bring together participants from different countries to come together to collaborate on the building project for cross-fertilization of skills and knowledge. Volunteers will be accepted until spots are filled. Spots limited to 30 international participants. Volunteers worldwide such as university students, recent graduates, and professionals who know how architecture is localized, uses the means and the materials available on the site to create a friendly building to the environment. Food and accommodation €100/$120 per week and project contribution is €400/$450. Airfare, visa and vaccination are on your behalf. Accommodation is by guest house and homestay in Diakunda. There is running water, and electricity by the public grid. At the site, you may access the Internet with pendrive wireless connection. There is a local cook to prepare meals for your workshop team. It’s not all works! Immerse in the local culture and lifestyle. Live and work among the local people. Take part in some of the social events in the everyday life of the community to gain new skills. There will be short breaks from the construction project to participate in field trips to experience any of the regional historic attractions, lush forest hikes or guided tours to explore the nearby villages and townships. If interested in participating in any of the workshops, contact us via info@nkafoundation.org.